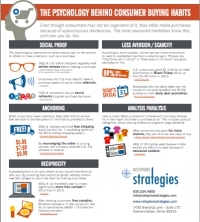 Even though consumers may not be cognizant of it, they often make purchases because of subconscious tendencies. Whether it's buying more to get free shipping or buying something just because "supplies are running out," the most seasoned marketers take advantage of simple psychology. To learn more, download the infographic below.